The Heart Sūtra - Indian or Chinese? Jan Nattier. 1992. The Heart Sūtra : a Chinese apocryphal text? Journal of the International Association of Buddhist Studies. Vol. 15 (2), p.153-223. The editors of JIABS are in the process of digitising their back issues which will be available for free download. In the meantime they have graciously given me permission to offer the pdf to anyone who would like a copy. Click here. Jan Nattier (left) is Associate Professor of Religious Studies, Indiana University, and a scholar of great merit and interest. The article is a fine example of contemporary scholarship, meticulously reasoned, well structured, and typically for Nattier, well written. This last is a strong feature of Nattier's published work - she can write very well. However the article also offers a startling conclusion with wide implications for Buddhists. The main argument of the article is that the Heart Sūtra was composed in China, incorporating some verses from the Chinese version of the Large Prajñāpāramita text, and back translated into Sanskrit sometime in the 7th century. Nattier also offers an explanation for the two different versions, one longer and one shorter, of the Heart Sūtra. Page references are to Nattier's article. Nattier focuses initially on the shorter version of the Heart Sūtra. This has several problematic features which distinguish it from sūtras generally and the other Prajñāpāramita sūtras in particular. Firstly it does not begin with 'thus have I heard'; second there is is no audience reaction at the end of the sūtra; third the Buddha makes no appearance; fourth Avalokiteśvara, the bodhisattva of compassion makes an unexpected appearance, while the usual characters of Prajñāpāramita sūtras (such as Subhuti) do not; and lastly the sūtra contains a mantra, which few other Prajñāpāramita sūtras do, and then only the later tantric sūtras. Any explanation of the origin of the Heart Sūtra should provide some insights into these oddities, and Nattier's article does just this. The best way to understand the progression is that the verses moved from the Sanskrit Large Sūtra to the Chinese Large Sūtra, and thence into the the Chinese Heart Sūtra, and finally into the Sanskrit Heart Sūtra. Which is to say that it is far more plausible on philological grounds that the Sanskrit Heart Sūtra is a translation of the Chinese rather than the other way around. Nattier proceeds to marshal supporting evidence for this conclusion beginning by considering known examples of back-translation - these are plentiful in Mongolian scriptures apparently. An important sign of back-translation is the choice of "unmatched but synonymous terms" (p.170). Also there may be occurrences of incorrect word order, grammatical errors point to the under lying language. In this case the evidence points to the Chinese Heart Sūtra as being a likely intermediary between the Sanskrit Large Sūtra and the Sanskrit Heart Sūtra: where the former has nirodha (extinction), the latter has kṣayo (destruction) while the Chinese Heart Sūtra has chin which can be a translation of either. This turns out to be true for each synonym in the Sanskrit texts. However there are still some problems. In particular the Chinese were usually very particular when composing apocryphal texts, taking a lot of effort to make them look like Indian sūtras, and yet the Heart Sūtra clearly lacks many important features. Nattier cites a Japanese study (by FUKUI Fumimasa) which she says make a strong case for reconsidering the Chinese title of the Heart Sūtra : hsin ching. Fukui says this should be understood not as saying that the text is the heart, or essence of the Prajñāpāramita tradition, but rather represents a "dhāraṇī scripture", ie simply a text to be chanted. It is clear that this has indeed been the function of the text since its earliest mentions. The missing attributes (such as the 'thus have I heard') are less of a problem if we accept that the text is not even attempting to be a sūtra. Most of the remaining problems occur in the portion of the text which surrounds the quoted verses - what Nattier calls "the frame". She seeks to show that it is plausible for the frame to have been composed in China. For instance the presence of Avalokiteśvara: this is quite consistent with devotional Buddhism in South West, 7th century China, and his presence is less surprising if the text is a devotional text for chanting rather than the essence of the Prajñāpāramita tradition. The presence of the mantra also marks out the Heart Sūtra as different. Nattier points out that the mantra is present in at least three other Chinese texts, and the epithets of the mantra also exist independently. (p.177). The point being that the presence of a mantra need not rule out a Chinese origin. I think this is the only place where Nattier misses a trick. Donald Lopez, for instance, has commented on the lack of coherence between the mantra and the text. "The question still remains of the exact function of the mantra within the sutra, because the sutra provides no such explanation and the sadhanas make only perfunctory references to the mantra". - Lopez. The heart sutra explained. p.120. The final mystery is the existence of the two versions of the sūtra. The evidence is good that the short version was the one which was most prominent version in China. All of the extant Chinese commentaries are based on the Hsüan-tsang's (or Xuanzang) 'translation' of the short version. If we accept the idea that the sūtra was back-translated into Sanskrit after being composed in China, then the long version makes sense in the face of Indian criteria for authenticity - which include the appropriate opening, the presence of the Buddha, and the audience reaction to the discourse. The long version supplies all these features that are missing from the short version. From the Indian point of view the short version is not a sūtra at all - which fits with the idea that it was not intended to be one. On purely philological grounds it seems that the Heart Sūtra was composed in China around the verses quoted from the Chinese version of the Pañcaviṃśatisāhasrikā Prajñāpāramita Sūtra. Internal textual evidence supports this conclusion, as do historical considerations. In short everything points in the direction of the 'Heart Sūtra' being a Chinese liturgical text which only became a sūtra on being back translated into Sanskrit, probably in India in the late 7th century. What is more, the most problematic features of the sūtra become comprehensible if we accept this view. Nattier spends several pages exploring the role of Hsüan-tsang in the popularisation of the text: it was certainly a favourite of the pilgrim/translator, and he did know it before he left on his trip to India. It seems likely, though it is not proven, that it was Hsüan-tsung himself who introduced the text to India and translated it into Sanskrit when he discovered that the Indians lacked it. We know that exactly this happened in the case of another Chinese apocryphal text, the Awakening of Faith in the Mahāyāna, which he translated into Sanskrit during his stay at Nālandā. Nattier's article is a fantastic example of the kind of careful and exacting scholarship which marks her out. The conclusions are monumental, and yet eminently accessible. I highly recommend reading the article. Her work deserves a wider audience, and her conclusions should be informing our understanding of Buddhist history, both social and textual. One thing is clear from this, and her other publications, we Buddhists cannot afford to be fundamentalists when it comes to texts! If you are interested in Kukai (空 海) and only know English then your choice of reading material can seem quite limited, especially if you only look at what is in print right now. There are of course a number of websites but these largely parrot what is found in Hakeda and Yamasaki. I wrote the current Wikipedia article on Kukai a couple of years back using pretty much those same sources, with additional notes from Abe. (Note there are moves afoot to abridge my text, so it may already look different). So where to go to get more depth on The Daishi when there are all too few Shingon teachers outside of Japan? This is my working bibliography of English language sources on Kukai, with some annotations. All of this stuff is available through interlibrary-loan in the UK, and probably Europe and the US; and some of it is available on the web. If you don't know about interlibrary-loan ask your local library to explain it. Transmission problems : the reproduction of scripture and Kūkai’s “opening” of an esoteric tradition. Japanese Religions, 28(1) 2003, p.5-68. Metaphor and Mandala in Shingon Buddhist Theology. Sophia: International Journal for Philosophy of Religion, Metaphysical Theology and Ethics, 47/1: 43-55, April 2008.
see also Gardiner's publications page at Colorado College website. Haresaku, Masahide. Encounter with an empathic, personal god : a seminar on Shingon Mikkyō. [Trans. Paul L. Swanson]. Bulletin (Nanzan Institute for Religion & Culture). No.5, 1987, p.2635. Hodge, S. (trans.) The mahā-vairocana-abhisambodhi tantra : with Buddhaguhya’s commentary. (London : Routledge Curzon, 2003). Hori, Ichiro. On the concept of hiriji (holy-man). Numen. 5 (2) 1958, p.128-160. Kimbrough, R. Keller. Reading the miraculous power of Japanese poetry : spells, truth acts, and a medieval Buddhist poetics of the supernatural. Japanese Journal of Religious Studies 32 (1) 2005, p.1-33. Kitagawa, J. M. Kūkai as master and saviour in Reynolds, F.E. and Capps, D. (eds) The biographical process : studies in the history and psychology of religion. (Mouton : The Hague, 1976). Orzech, Charles. The legend of the iron stupa in Lopez, Donald S. [ed.] Buddhism in practice. Princeton University Press. 1995. - The semiotic articulation of Hosshin Seppō : an interpretive study of the concepts of mon and monji in Kūkai’s mikkyō in Astley, I. (ed) Esoteric Buddhism in Japan. (Copenhagen : The Seminar for Buddhist Studies, 1994). p.17-36. Rouzer, Paul. 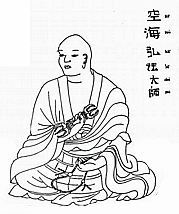 “Early Buddhist Kanshi : court, country, and Kūkai”. Monumenta Nipponica. 2004, 59(4) : 431-61. Kōbō Daishi and the art of esoteric Buddhism. Monumenta Nipponica. 1983, 38 (4), p.409-12. Toby, Ronald, P. “Why Leave Nara? Kammu and the transfer of the Capital. Monumenta Nipponica. 1985. 40(3) : 331-347. Totman, C. A history of Japan. (Blackwell, 2005). The Blue Rite is also called The rite of subduing or overcoming. Sometimes it is known as the Black Rite or the Rite of Destruction, but that is in another context from the one that I am considering. This is the magical rite performed by Akṣobhya the blue Buddha of the eastern quarter, and which is related to the story of the defeat of Mara. What is being subdued are the poisons, in this context the demons, of greed, hatred and doubt as they occur within us. When we experience very strong hatred or greed then that does have a demonic feel to it. Under their influence we lose the ability to choose our actions, we may well behave in ways that we are later ashamed of. I want to be very clear here that I do not advocate applying this, or any other, rite to other people! Unless we have a very clear understanding of, and love for, the other person; a high level of trust; and a lot of skill and experience it is not advisable to start practising any of the rites on others. In any case our own inner demons, our own greed, hatred, and doubt, give us plenty of material to work with. One can immediately say that there might be a general approach to subduing all demons, based on the response of the Buddha to Mara, which is simply not to respond to them. If we do not respond to greed it has no power over us; if we do not act on hatred it cannot hurt us; if we are confident in our practice then doubt has no purchase on our minds. So this is the first level of defence against demons - not reacting. The story of the defeat of Mara shows how powerful not reacting can be. Padmasambhava was a great subduer of demons. He would fight them with magic, often neutralising their magic with his own, but then he would always give them an initiation, a secret name, and a treasure to guard. In other words these demonic, or perhaps more accurately chthonic forces within us, which can threaten to overwhelm us and defeat us, are energies that can be harnessed and put to good use in other ways. The same demon that causes us to hate, can function as a protector. In a psychological sense our demons are often just adaptations to extreme situations. For instance if we grow up with a lot of violence, then we will adapt to protect ourselves from that violence, and may even become violent ourselves. The energy that protects me from violence, may have violence at it’s root. This is not a justification for violent behaviour however. It is important not to lose sight of the transformation which demons undergo at the hands of Padmasambhava - when subdued and named they become Dharma protectors, and guarders of our treasures. Padmasambhava had a very potent weapon in his battles against the demons. He had what in Tibetan is known as a purbha – a demon dagger. The demon dagger is used to pin down demons. It has a blade or point which emerges from the mouth of a mythical beast which is a mix of a crocodile and a fish: called a makara. Above the makara is usually the head of a Buddha which has multiple faces. And finally either the head of a horse, or a the end of a vajra. The Buddha head reminds us of the purpose of the purbha – it is not a weapon designed to hurt people, but to help release us from the grip of a demonic energy. With the purbha you pin down the demon so that you can have a conversation with it. Padmasambhava took this opportunity to give the demons a secret name and a treasure to guard. This is a useful procedure with demons, and contrasts sharply with the image of the Archangel Michael, or later St George, killing the dragon - I'll come back to this in the next paragraph. So one thing we might do when we wish to work with the Blue Rite is to make ourselves a demon dagger. We can build in symbols of power and strength which resonate for us. This may help us to get into communication with our demons, to see that they really want to protect us, and to help us find better ways of going about it. Another way of thinking about this came to me the other day. I was reminded of the scene early in the story of Peter Pan. His shadow had come loose and is causing trouble. He meets Wendy who helps him to catch his shadow and she sews it back on for him. Jung talked about those aspects of our psyche which we do not accept as being our 'shadow'. The qualities which are not accepted need not be bad. For many years I was unwilling to take on the artistic side of my self and would not give it attention. If we take this kind of view of things then we treat the expressions of greed, hatred and doubt as coming from the psychic shadow. In the Jungian view they are unacknowledged bits of ourselves which have taken on a kind of autonomy. A demon dagger helps us to pin them down, so that we can reclaim them, sew them back on. If the demon is really just an unassimilated part of our own psyche, then we don’t want to kill it, we want, like Padmasambhava, to convert this rebellious energy into some more useful form. The main idea, then, is that the Blue Rite, is the rite of overcoming and subduing hindrances to spiritual progress; the conversion of demonic forces into Dharma protectors. It is a way of working with inner demons which block our Awakening.